Club Penguin Cheats by Mimo777 Club Penguin Cheats by Mimo777: Club Penguin Stealth Agent Message From G! I am loving all this class stuff! I personally am fond of the Tech Class. Thanks for always keeping me updated Mimo! Lol:) I do the same thing as you, except I spy on my brother. But I'm more Tech Class. I like the Tech Class too. 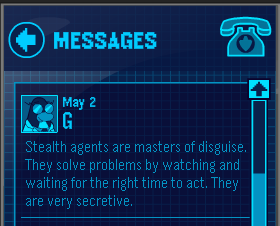 I'm tactical class and stealth class, also agent class. I have enough medals to get another class. But it seems my tactical and stealth class will be great for combat. It would be awesome if we got combat warfare missions with snowballs and stuff. mimo when are you gonna have another party thingy?